Albuquerque residents have been able to visit their public library at the northwest corner of Edith and Central since 1901, when Joshua and Sarah Raynolds donated Perkins Hall to the City of Albuquerque. After Perkins Hall was damaged by fire in 1923, the City dedicated money from a 1924 bond issue to build the current structure. Erna Fergusson was among the citizens who lobbied for the Pueblo Revival style building. Architect Arthur Rossiter teamed with artist Gustave Baumann to build a unique facility that opened to the public on March 22, 1925. Additions in 1947 expanded the stack area, the reading area and the children's room, increased office space for the staff, and made bookmobile service possible. 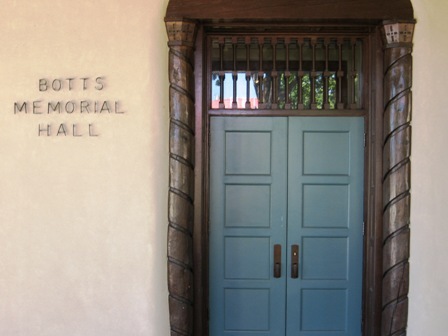 1951 saw the addition of Botts Memorial Hall and the portico to the south side of the building. 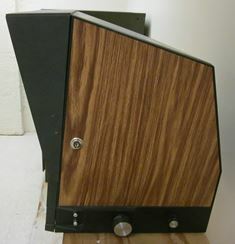 By the 1970s, the library system’s needs outpaced the building's capacity. A new Main Library was built downtown at 5th and Copper. Losses of historic buildings like the Alvarado Hotel (1970) underscored the need to preserve the old Main library. After renovations, the building was reopened in 1978 as the Special Collections Library. The former children's area became the Center for the Book. 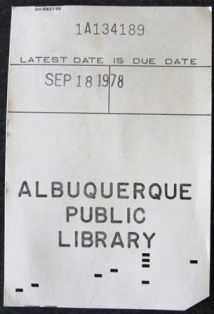 The City Council recognized the Old Main Library as an Albuquerque Landmark in September 1979. The 2010-2012 renovation included the first complete refurbishment of the historic windows, new stucco, new cork flooring in the reading room, new heating and cooling systems in Botts Hall and the Center for the Book, enhanced acoustics and audiovisual system in Botts Hall, upgraded electrical and data, and accessible bathrooms. 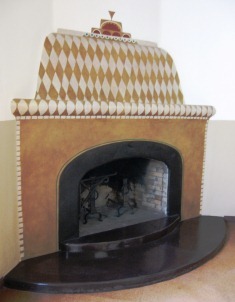 The replacement of the hard ceiling in the Center for the Book, uncovering of windows in the west reading room, a new ceiling in the New Mexicana conference room, and the restoration of the 1925 Gustave Baumann murals around the fireplaces and main door were also accomplished. The building reopened to the public on June 5th, 2012. 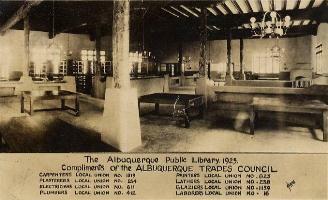 From 1901 to 1948, Albuquerque's only public library facility stood at the northwest corner of Edith and Central. The post-World War II baby boom and the influx of workers at Sandia National Laboratories and the military bases meant a growing population, a growing city, and a need to add library services and facilities to meet added demand. 1947: Bookmobile service to outlying areas in Bernalillo County began. 1948: Ernie Pyle Library opened in the late war correspondent's house on Girard SE. 1954: Los Griegos Library opened. Prior to being officially named for its neighborhood, it was occasionally referred to as the Northside branch. 1957: Prospect Park Library opened. Since 1957, it has been renamed twice. From 1982 to 2007 it was called Wyoming Regional Library. 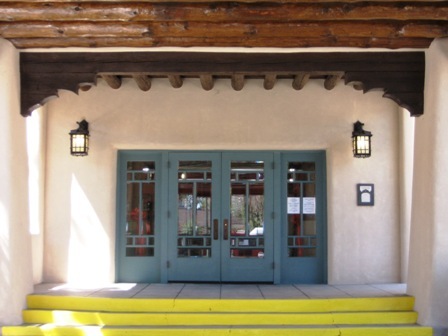 In 2008, it was renamed Tony Hillerman Library in honor of the renowned author and respected neighbor. 1958: The South Valley Library was opened by the Lions Club in the Westside Community Center. Upon its 1974 move into its own building, it became the first library built and administered by Bernalillo County. The current, larger South Valley Library building opened in 1990. 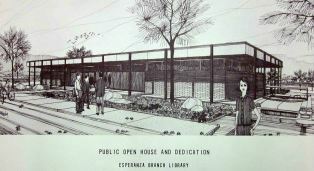 1964: Esperanza Library opened. 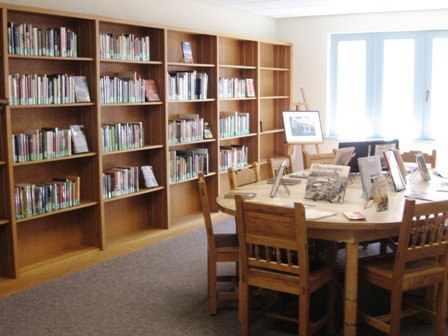 This library closed in 2001, when Alamosa Library opened as part of the Alamosa Community Center. The former library building now houses Esperanza Community Bike Shop. 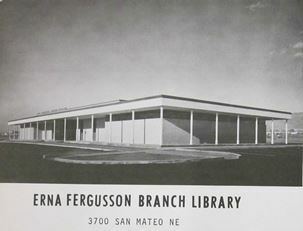 1966: Erna Fergusson Library opened. The library's name commemorates Erna Fergusson, author and library advocate. The original structure was rebuilt between 2001 and 2003. 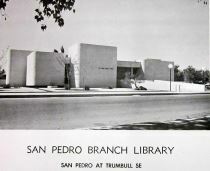 1967: San Pedro Library opened. 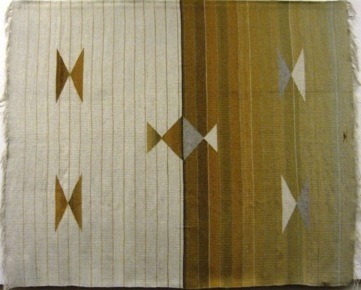 The Mid-Century modern design by architect John Reed received one of the two First Honor awards from the Albuquerque Chapter of the American Institute of Architects. The other honor award for 1967 went to the UNM Arena. 1970: Two Model Cities Libraries opened in the South Broadway neighborhood as part of a grant-funded national urban development initiative. After Model Cities funding ended in 1974, the libraries became South Broadway Library, part of the South Broadway Cultural Center. The current building opened in 1994. 1975: Main Library opened. George Pearl, the architect for the new Main, drew praise for many aspects of the library's design, but its wheelchair accessibility was particularly noted. 1983: Juan Tabo Library opened with a collection of 15,000 adult and 7000 children's books. In its first year, its circulation (books checked out and in) approached 30,000 volumes per month. 1986: City of Albuquerque and Bernalillo County governments entered the joint powers agreement that created the Albuquerque/Bernalillo County Library System. 1987: Lomas Tramway Library opened. Lomas Tramway was the original home of sculptor Sarah Perry's Gorilla Route #66, also known as Armstrong the Gorilla. 1989: Taylor Ranch Library opened in its current building. For several years prior to 1989, the library operated in 1100 square feet of rented space at 4701 Montano Rd NW. 1994: North Valley Library opened in May, the second of three county libraries to be completed under the joint powers agreement. 1994: East Mountain Library opened in October, the third Albuquerque/Bernalillo County Library System's three county libraries..
1998: Westgate Heights Library opened and remained the only Public Library housed in a modular building until renovation in during winter 2017-2018. 1998: Cherry Hills Library opened. The library was initially referred to as Harper Barstow. 2001: Alamosa Library opened as part of the Alamosa Community Center. 2015: Central & Unser Library opened on April 18.